Are you going on a trip and wondering what to buy in Tanzania? 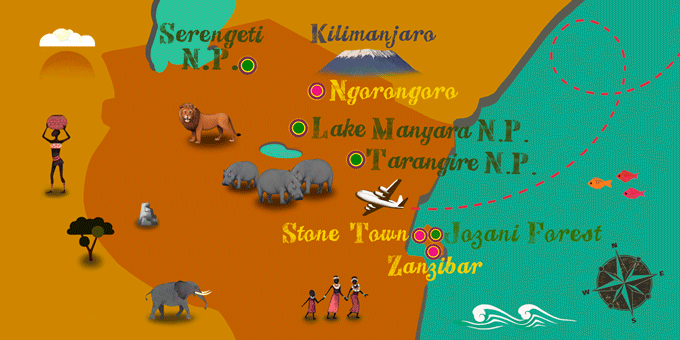 Tanzania is a country situated to the east of Africa whose main tourist attraction and source of income are safaris. However, it also stands out for its bright and colourful crafts which are handmade by the area's tribes. There are also unique items that you will only find there, such as tanzanite. Below we offer you a series of traditional products from Tanzania that you should make space in your suitcase for. If you are looking for truly special souvenirs of Tanzania, you have to get yourself a shuka which is a type of large shawl with different coloured squares which are usually worn by the Maasai people. The shuka has an interesting history behind it which goes back to Victorian times. They were introduced to the country when the first English missionaries and explorers started to arrive, and they used these Scottish fabrics as hard currency with the Maasai tribe. Nowadays its production takes place mostly in China, although the colours and combinations continue to be characteristic and unique of the original Shukas. This traditional shawl and Maasai symbol has transcended borders to become a fashionable accessory that can be used in any number of ways. The Maasai are also skilled craftsman of leather and wood. They work with different types of wood although ebony is the most valued. You can find masks, figures, decorative carvings and objects made of leather such as baskets, sandals, wallets, etc. It is a good option if you’re not sure what to buy in Tanzania. Another of the typical Tanzanian products is tanzanite. It is a precious stone of considerable value which is found in the Mererani hills to the north of Tanzania and near to Kilimanjaro. Tanzanite deposits are scarce which turns it into an even more unique material. It is a tri-colour crystal with purple, burgundy and sapphire blue tones, depending on the orientation. It is used as a gemstone in jewellery and it was in fact the popular brand Tiffany & Co. who baptised this beautiful stone with the name of the country where it is extracted. If you don’t know what to buy in Tanzania, another interesting option are kikoys. They are beautiful cotton fabrics used as a sarong in the hottest regions of East Africa. Both men and women use them wrapped around the waist as a skirt or trousers. They can be found in different colours, dyed with natural dyes. The kikoy also has ancient origins which date back to the trade relations that the Arabian merchants have had on the Eastern coast of Africa in the last twelve centuries. In spite of it being of Arab heritage, throughout all of this time, the kikoy has acquired its own personality, as well as extending its uses. And as well as its use as clothing, kikoys are used as turbans, scarves, table cloths, parasols, towels, curtains, to make a bundle or even to filter coffee. 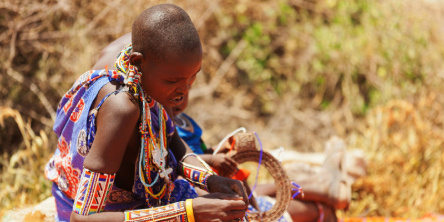 Maasai crafts are another of the typical Tanzanian products that have travelled the world. The bracelets, necklaces or other types of trinkets, made of coloured beads are characteristic of this tribe and are a must-have to wear in any country and continent. They are handmade by the Maasai women. Other interesting craft pieces are the sticks of the Maasai leaders or the spears of the warriors. They are also handmade and decorated with coloured beads. The Maasai know that we love their crafts and each time they expand their offer, so that you can find lots of different items. It is recommended that you purchase Tanzanian souvenirs preferably in the Maasai villages themselves. You can visit them in different areas such as the Ngorongoro Conservation Area, the south of the Serengeti or the Esalali Women's Project in Karatu which is located between the Crater and Lake Mayara. This way, you contribute to boosting the women’s cooperatives and the local Maasai economy. If you already know what to buy in Tanzania, now you need to learn to haggle. Many tourists find haggling difficult because they aren’t used to it and they feel aggressive or uncomfortable when buying using this method. However, it is a habitual custom and something which is assumed and expected, even in souvenir shops. In order to do it like an expert, firstly you should offer the seller half of what they are asking for. The shop assistant will be alarmed and will exaggerate their outrage to then make you another offer. It is important to be friendly, negotiate calmly and with a sense of humour. If you're not convinced of the offer or you don’t manage to agree a price, you can try in another place. You just need to drop the shame of haggling to end up enjoying it. Exchanging objects is also habitual in Tanzania and you can reach an agreement by exchanging products. You probably have objects that you don't mind letting go of and which are of great value to the Maasai. Footwear, a watch you don’t use, a hat or a t-shirt you are bored of, etc. They are things that they may be willing to swap for a Maasai blanket or a beaded trinket. Now you know which are the traditional products of Tanzania and where to find them, you can plan your trip to the African country better. If Tanzania has caught your attention, leave us your number so we can call you to discuss the voyage that awaits you.